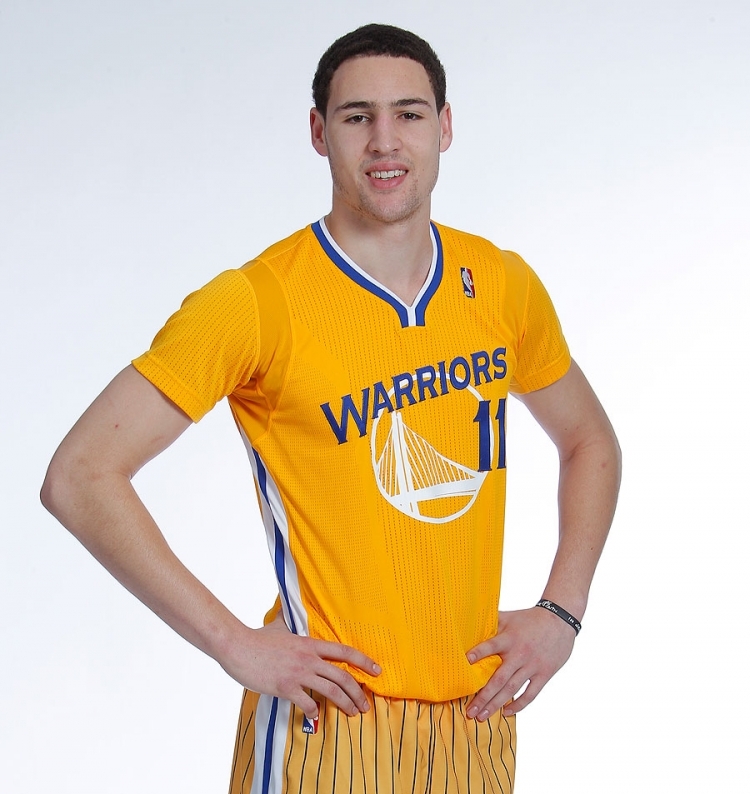 1) The new uniforms show the Warriors’ commitment to being innovative and stylish. According to the Warriors and adidas, the new uniform is made from 60% recycled materials, dries twice as fast as other jerseys, uses lightweight stretch woven fabric in the shorts, and uses 360-degree stretch fabric in the armhole and shoulder of the sleeves to allow for maximum movement and range of motion. 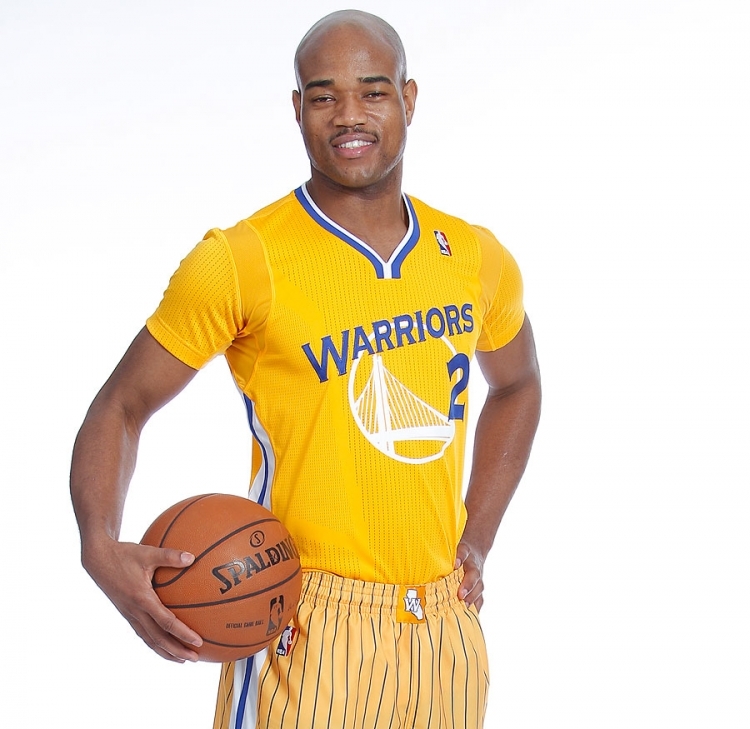 The new uniform is also 26% lighter than the Warriors’ current uniforms. Are they really stylish though? Let’s be honest here. They’re not the prettiest pieces of clothing to look at. First of all, the yellow on the shirt is different than the yellow on the shorts, seen in the pictures below. The shorts are technically “gold,” but, regardless, it looks like the players are wearing shirts and shorts of different brands that use different versions of yellow. Or that the player got dressed in the dark. It looks wildly unprofessional and unfinished. So, how does that equate to style? I’m not sold. Also, you know what would make the jerseys even lighter? No sleeves! The new uniforms could stay sleeveless, but still use the new lightweight fabric that adidas wants to show off. They could’ve made super lightweight tanktops like a track jersey or something. That would’ve been “revolutionary,” but still “stylish” and not the latest laughing stock of the NBA. 2) The Warriors organization is confident that fans will love the new uniforms, and the uniform was designed with the fans in mind. First of all, through some simple observations on various social media websites and of comments made by fans on the official photos and blogs the Warriors have posted about the new uniforms, I’ve noticed the majority of fans don’t like the new uniforms and think they’re ugly. A lot of fans don’t like the sleeves and find it somewhat embarrassing actually. So, strike one for the Warriors organization. Although it’s great to see adidas strive to be as progressive as possible in terms of uniforms, the adidas Revolution 30 uniforms are very expensive also. A swingman Revolution 30 uniform is $105 compared to a normal swingman jersey, which is $90 at the NBA Store for the road jersey, and $60-$70 for the home jersey. The new uniforms, because of the new, progressive technology, is $110. Strike two for the Warriors organization. Maybe my point of view is slightly biased because I’m a college student, but that is way too expensive. Spending $90 or $100 on a jersey is already a lot, so why would a fan spend $110 on a sleeved jersey that isn’t even that popular? An overly expensive jersey doesn’t exactly seem like a product designed with fans in mind. 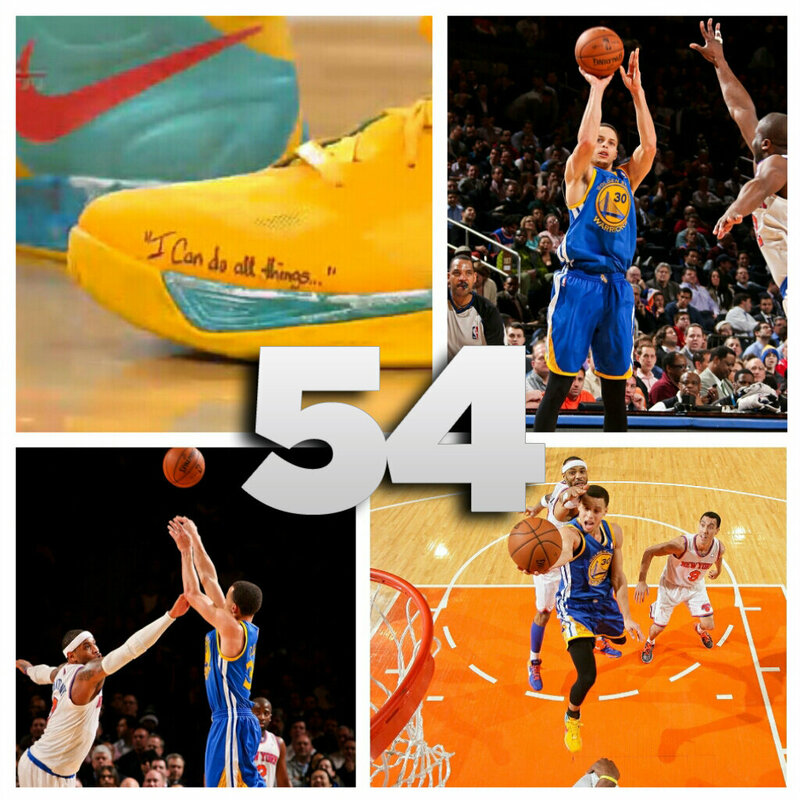 3) The Warriors are the Bay Area’s team, and it is reflected in the uniform. After the announcement that the Warriors would move to San Francisco in 2017, their entire ad campaign for the upcoming 2012-2013 season centered around how the Warriors are the Bay Area’s team, possibly trying to show the fans and the city of Oakland that the Warriors organization still cares about them, despite the planned move to San Francisco. The new uniforms are walking ads that the Warriors are the Bay Area’s team as well. COO Rick Welts explained in the introductory press conference that the pinstripes on the shorts, aren’t in fact pinstripes. They’re representative of the cables on the Bay Bridge, which symbolizes how the Warriors are truly the Bay Area’s team. If that sounds a little crazy to you, just wait. In addition to the pinstripes, oh I’m sorry, the cables, the shorts also feature a stripe down the side, which comes to a distinctive point at the bottom of the shorts. According to Welts, this is representative of a spear that a typical Warrior would carry. *Insert cricket noises. * Really? Spears? This sounds more like an explanation of a 12 year-old’s book report or diorama than a professional sports team’s jersey. I couldn’t help bursting out into laughter when I heard Welts describe the shorts this way. I seriously doubt that’s a reaction that the Warriors wanted and expected, which is a little scary, in my opinion. 4) The NBA is the only major sport that doesn’t have sleeved uniforms, so this new uniform is a way to be revolutionary and progressive. Excuse me if my upcoming explanation is painfully simple or obvious, but the NBA has been using sleeveless jerseys because it makes it easier for players to shoot, rebound, defend, dunk, etc. Am I being too logical right now? 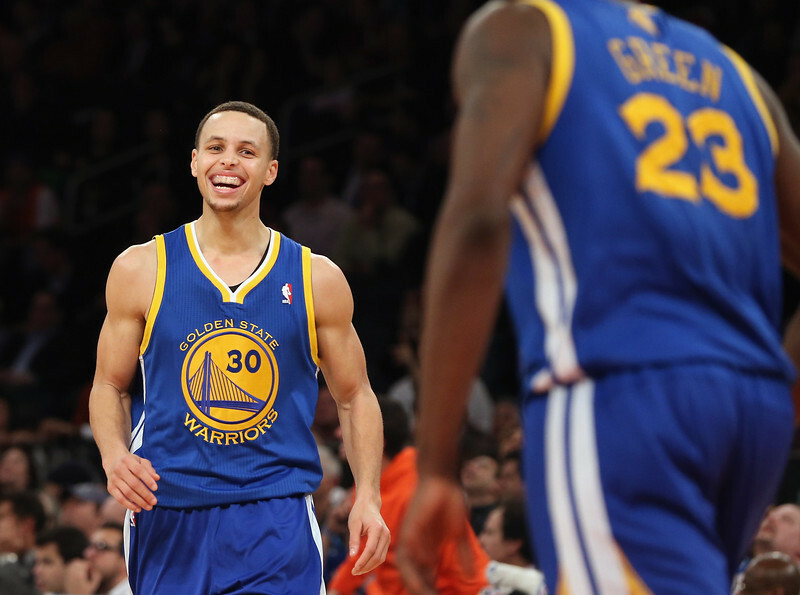 There’s a very obvious reason why the the NBA doesn’t have sleeved uniforms. It’s not some kind of silent protest to sleeves. Harrison Barnes and other members of the Warriors claim that the sleeves don’t impede their shooting motion because it’s so light, but I’m convinced that sleeveless jerseys still give a player a little more motion and flexibility. However, this isn’t the main issue about this statement by the Warriors. How is it being “revolutionary” or “progressive” to conform to what every other sport does and has been doing for a long time? Why would an NBA team want to conform to using a sleeve? Maybe I’m missing something, but I don’t see how it’s innovative to use a sleeved jersey, in order to be like every other sport. The NBA used sleeved jerseys a long time ago, so it’s not like this has never been done before. Revolutionary and innovative? Not so much. The whole marketing of this new jersey has been extremely flawed. The portrayal of the benefits of the jersey has been somewhat effective, but the style and the initial notion behind the jersey is completely wrong. Since these jerseys are the Warriors’ alternate jerseys, fans won’t have to see them too much during the season, thankfully. 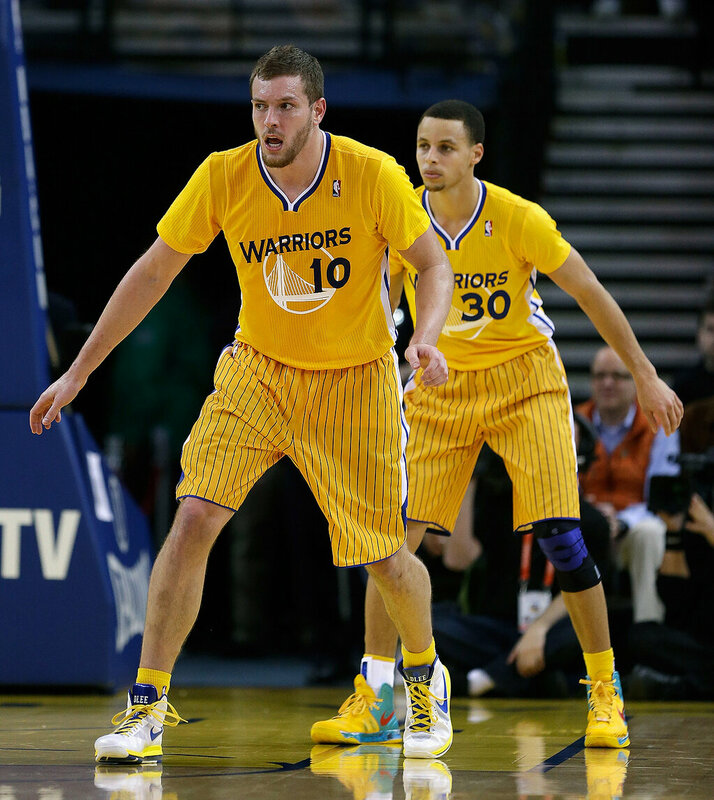 However, I wish the Warriors organization was more tactful when they designed these jerseys. There are obvious flaws and in an attempt to keep these jerseys hidden and surprise fans, they completely forgot to ask fans in the preliminary stages if they even liked them in the first place. I think with some tweaks (most importantly, matching the yellows), these jerseys wouldn’t be too bad. Great endorsement, right? However, if the Warriors truly are the Bay Area’s team and if the Warriors organization does really want to please the fans with this jersey, they would’ve come up with a much better design with input from the fans. That would’ve been a fun, interesting social media campaign that the Warriors could’ve run. 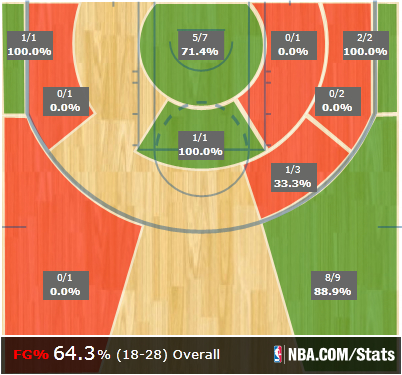 Unfortunately, this is strike three for the Warriors organization. The new uniforms are out, and they’re not looking good. 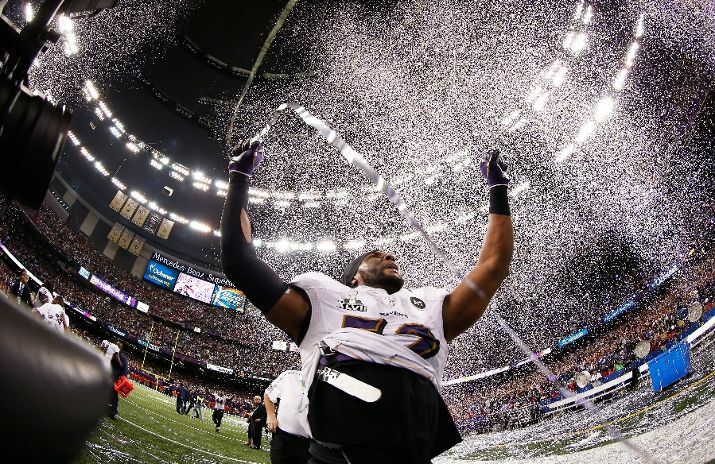 In case you missed it, the Ravens beat the 49ers 34-31 yesterday in Super Bowl XLVII. The Ravens looked strong from the very beginning. The Niners looked pretty awful in the entire first half, and they didn’t look like the Niners we’ve seen all season until the third quarter. It almost looked like they came into the game knowing they were favored, so they were overly cocky and knew that they would win. When the Ravens came on the field at the beginning of the game and their offense looked great, the Niners got a reality check and played tense the rest of the first half. Once the Niners got over their cockiness and the realization sunk in that they might actually lose, they started playing Niner football. It was too little, too late though. At the end of the game, there was an awful no-call when Michael Crabtree was held by Ravens cornerback Jimmy Smith. However, I think fans need to get over the no-call. That was not the sole reason why the Niners lost the game. Yes, a defensive holding call would’ve dramatically improved their chances at getting a touchdown, and, therefore, winning the game, but the Niners had already dug themselves into a deep trench by halftime. They were down 21-6 at halftime, and they were down by as many as 22 points at the beginning of the third quarter, after giving up a 108-yard kickoff return to Jacoby Jones, the longest kickoff return in the history of the NFL. They looked like they were on the verge of yet another miraculous comeback after scoring 17 points in four minutes and ten seconds in the third quarter. Yes, the Niners were close to digging themselves out of a hole and, yes, they have been the “Comeback Kids” this postseason, winning against both the Packers and the Falcons after being down after the first quarter or at halftime. However, the Niners’ poor play in the first half was too much to overcome and was the main reason why they lost. What were some specific aspects that the Niners could have improved upon, mostly in the first half? 1. Play-calling: This was an issue for a lot of the game. The Niners were seven yards away from the end zone and had the possibility of sealing a victory with a touchdown towards the end of the game. They had four chances, seven yards out, and they couldn’t advance the ball at all. There were some serious issues with play-calling in all four of those plays, and in the first half, it seemed like the offense had no idea what to do. Colin Kaepernick had thrown an interception so his confidence was thrown off, Frank Gore wasn’t effective in the first half, and LaMichael James had a huge fumble at the beginning of the second quarter that helped the Ravens take a 14-3 lead. The offensive execution was halted in the first half because of poor play-calling by Greg Roman, the offensive coordinator, and Jim Harbaugh. 2. Poor use of timeouts: The Niners had to use one of their three timeouts in the second half with 7:53 left in the third quarter because of confusion or miscommunication between Harbaugh/Roman and Kaepernick. This is simply unacceptable when a team is already down, in need of some momentum, and playing in the Super Bowl. This has become a pattern for Kaepernick over his 10 starts. He lets the play clock wind down and, many times, is forced to call a timeout to prevent a delay of game call. The Niners screwed themselves over later in the game by having to blow a timeout so early because of confusion or miscommunication. 3. Special Teams: David Akers made three field goals, which was good to see, but he also showed no attempt on kickoffs to kick it away from Jacoby Jones or at least make him work for a good return. The Niners allowed the longest kickoff return in NFL History at the worst possible moment. Enough said. 4. The Secondary: In the first half, Joe Flacco completed 13 of 20 passes for 192 yards and three touchdowns. The Ravens also went 9-of-16 on third downs. Again, this is unacceptable. Chris Culliver simply got out-played, and even though Carlos Rogers covered Anquan Boldin pretty well, Boldin was a huge reason the Ravens’ offense was so successful. 5. LaMichael James and Randy Moss: LaMichael James’ fumble in the beginning of the third quarter, mentioned earlier, was huge and occurred, again, at the worst possible moment. The Niners were finally starting to gain a little momentum after a few good offensive plays, and then all that momentum was quickly taken away with that one play. Fumbles are unacceptable during the Super Bowl. In addition, Randy Moss had no impact on this game, and it really hurt the Niners. In addition to his limited production, it seemed like he made no effort whatsoever to catch, or at least deflect, that pass that Ed Reed intercepted with 7:06 left in the second quarter. That pass was probably uncatchable, but Moss has to at least show a little effort and help out his quarterback as much as he can. **Note: Although Kaepernick threw the first interception in Niners’ Super Bowl history and looked shaky in the first half, he had a stellar second half and almost pulled off one of the most amazing comebacks in Super Bowl history. It also should be noted that Alex Smith would 1) not have gotten the Niners to the Super Bowl in the first place and 2) would not have won that game for the Niners. 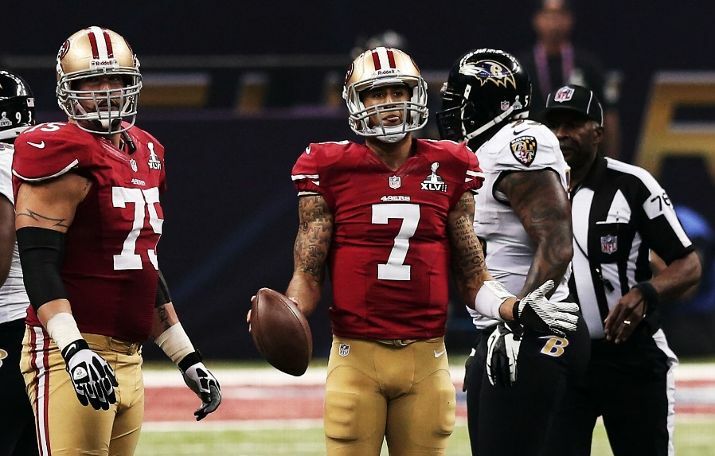 Kaepernick might be young, but he is already a greater quarterback than Alex Smith. He is more willing to take risks and he is better at improvising when a play breaks down. That’s how the Niners got to the Super Bowl. His interception wasn’t the reason why the Niners lost that game. Alex Smith couldn’t have recovered from a poor first half from the whole team, and he certainly wouldn’t have led that type of comeback. Enough of that rant. Carry on. 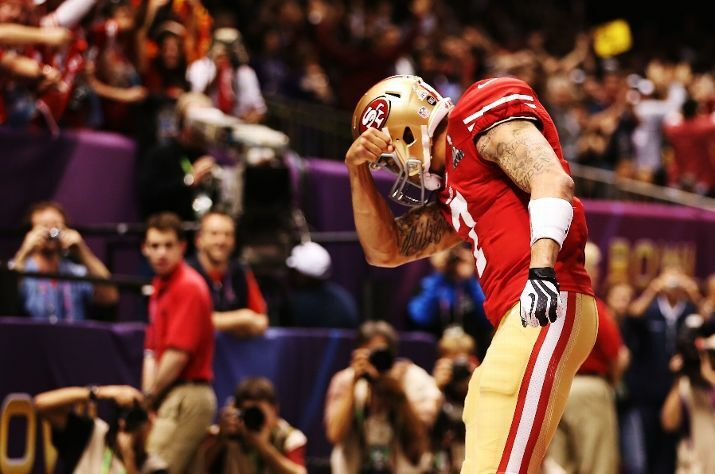 Even though this Super Bowl loss was quite disappointing to fans, the Niners had an incredible season. Fans have a lot to be proud of. The Niners had nine players be named to the Pro Bowl this season, and seven of those players would have been starters. They were: FS Dashon Goldson, LG Mike Iupati, LB Aldon Smith, DT Justin Smith, LT Joe Staley, SS Donte Whitner and LB Patrick Willis (LB NaVorro Bowman and RB Frank Gore would have come off the bench). In addition to those nine players, seven other players were named as alternates at the Pro Bowl. Those players were: RG Alex Boone, LB Ahmad Brooks, OT Anthony Davis, TE Vernon Davis, C Jonathan Goodwin, P Andy Lee, CB Carlos Rogers and C.J. Spillman. Also, we all were witnesses to the emergence of Colin Kaepernick as a starter and potential star quarterback in the NFL. It’ll be great to see a full season of him starting to see what he’s really capable of. With a full season of Kaepernick and perhaps a change in offensive coordinator (or at least some more effective, sensible play-calling), the Niners can get back to the Super Bowl again next year with much more confidence (instead of cockiness) and intelligence. The “Quest For Six” continues.